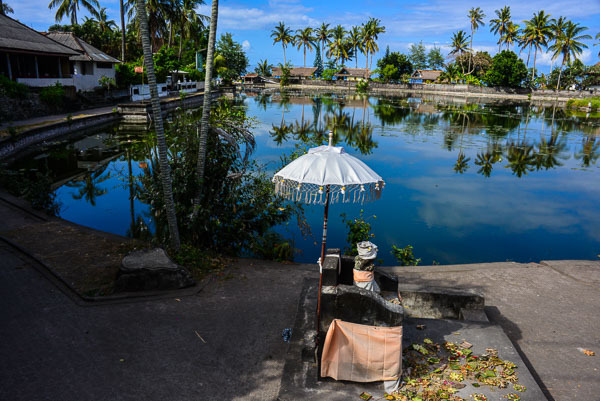 Bali has always been a great favourite of ours, and on a trip there in 2012, we were talked into buying a “holiday package” which promised a-lot for not-a-lot over three years. You would think that experienced travellers like us wouldn’t fall for such things, but we did … it just goes to show how gullible we are, drawn in once more by smoke and mirrors! One of the problems we discovered with this package is how to actually use all the offerings up in the three years available. We struggled to get bookings we wanted in India the next year and choices in Europe were everywhere except France. We spent most of our time in France. Not looking good. 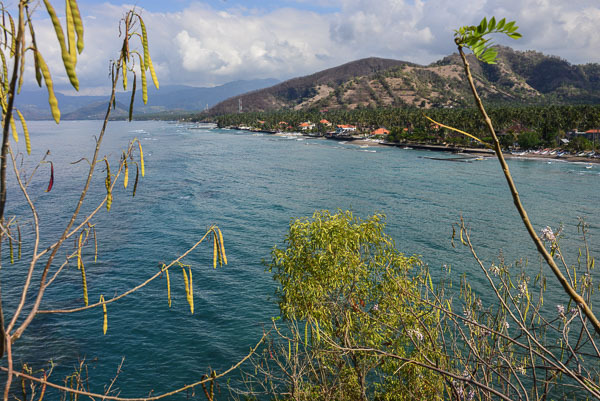 The package came to an end this year and so we had saved up the best bit … two luxury weeks in a one bedroomed apartment in Bali … and it was time to book it. The other bit left, was a 2 for 1 cruise voucher so we decide to combine the two and go by boat to Bali! Here we are in Sydney ready to board the Carnival Spirit. Several hours later we are on board! Sydney harbour is so beautiful at this time of year! The ‘Coat-hanger’ and the ‘Nuns-in-a-Scrum’ in plain view! It’s a very long queue and we look longingly at those with a VIP check in pass who skip past and wonder how to get one. Actually, the answer is obvious … money! 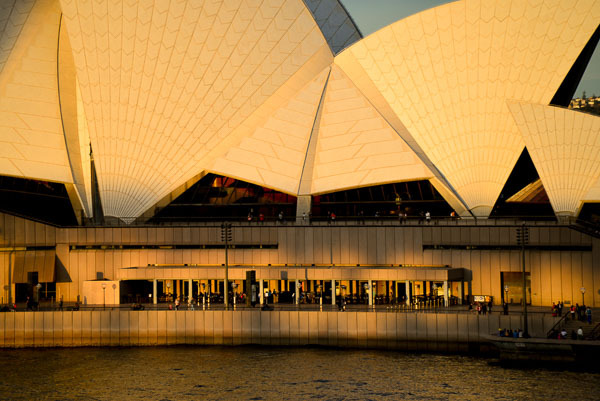 From the deck, the Sydney Opera house glows in the evening light. 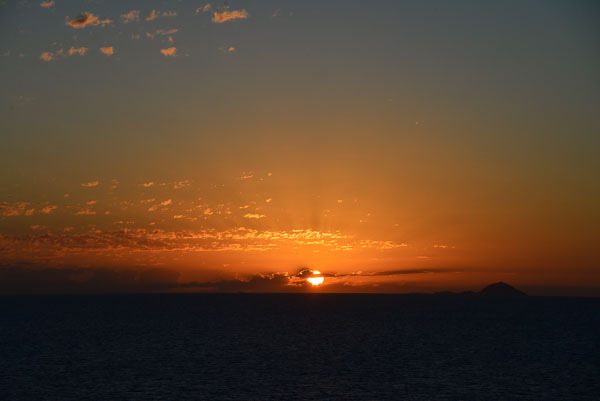 We had hoped to be sailing out through Sydney heads at Sunset time, but due to the very slow check-in, the heads slide silently past in the dark … a few twinkling lights bid us farewell as we head north towards Brisbane. Strangely enough, we have been to Brisbane a few times before, so we plump for a walk from the boat rather than follow the crowds to the city, or heaven forbid the Gold Coast. (Nothing wrong with the Gold Coast if you like high-rise hotels, theme parks, surf beaches and casinos … “mmm” I hear a few of you saying, “sounds good!”). Anyway it’s the car park for us. Thing is, this particular boat won’t fit under the bridge and so can’t get to the “proper” cruise ship terminal … we have to stop at the grain terminal instead. Off the ship and half way across the car park we are approached by a cark park attendant who tells us not to take photos of “infrastructure” or we will have the security guys on our backs. The world is going mad! 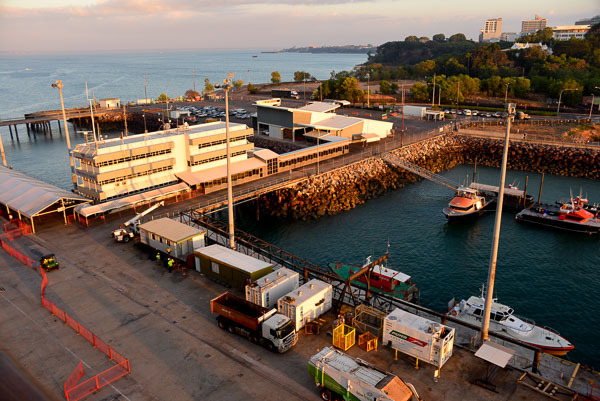 imagine someone wanting to plant a bomb in the Brisbane grain terminal! 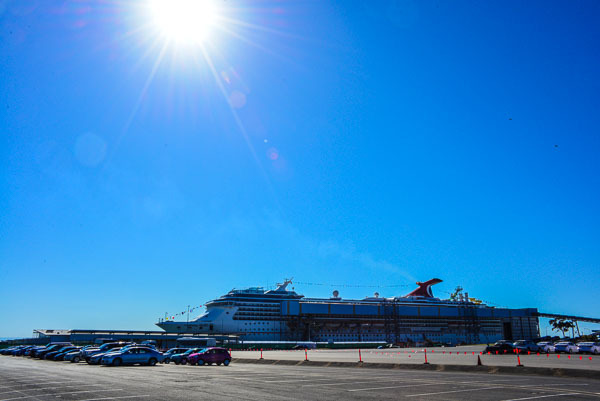 Brisbane – Boat parked in car park! On this day, the best thing about Brisbane is leaving! 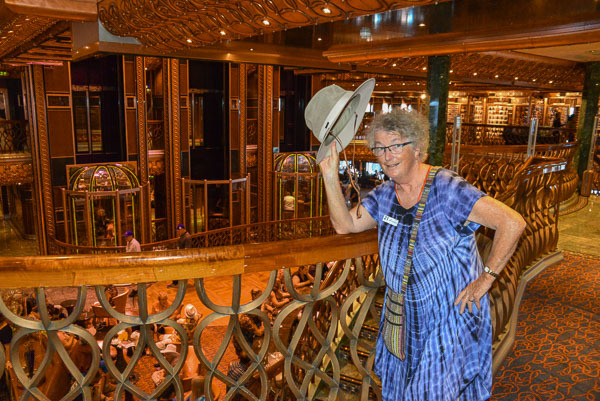 When choosing this cruise (there I’ve mentioned that word) we looked at Lombok, Bali and Singapore as the places of interest, and largely ignored the Oz stops. 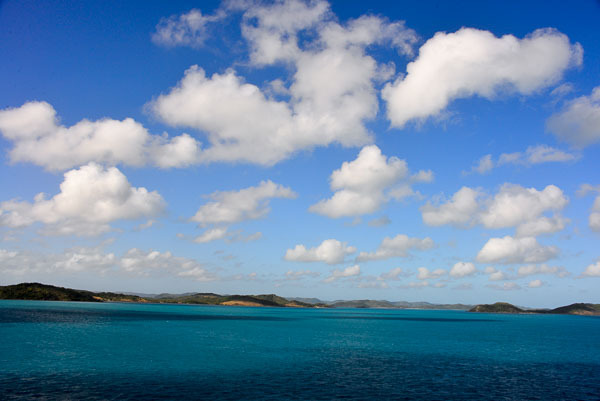 As it turns out after a stroll through Airlie Beach (amazing how you can become so blasé about places … you know tropical, barrier reef, whitsundays and all that) we find ourselves sailing up the inner passage, between the Great Barrier Reef and mainland Oz and it’s a real treat. We enter the Torres Straight and Thursday Island (Sunday, Monday and Wednesday islands too) slip past accompanied with a commentary by the Reef Pilot about the long history of the area. Such unexpected beauty! This really feels like the voyage we were hoping for. So who’s going to tell me there is no Monday island? Darwin, is well … Darwin, and by sheer chance close friends from Albany are here on holiday. 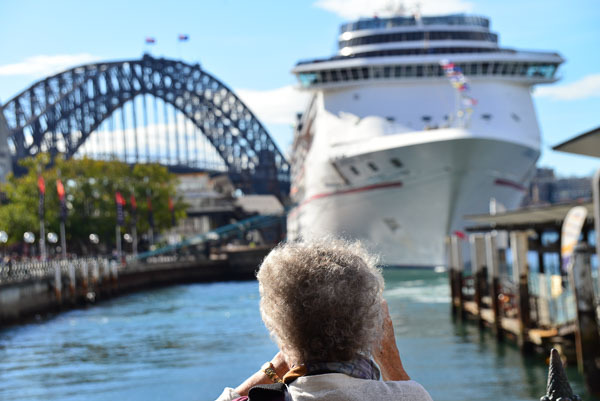 Ken and Kathryn are sitting on the wharf as we disembark (in the language of cruising) and we spend the day eating, drinking coffee and visiting the Museum before re-embarking (there I go again) and waving them farewell. 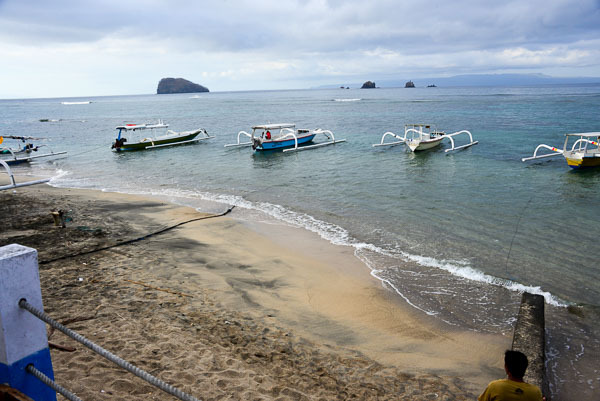 And so on to Indonesia – next stop Lombok. The cruise director (who had the LOUDEST VOICE – so much so fingers immediately leapt to ears when he made an announcement over the speakers) has assured us that a tour was the only way to go in Lombok, since the place of docking was a long way from anywhere we would want to go and so we reluctantly shell out our $180 and get on one of the row of buses. 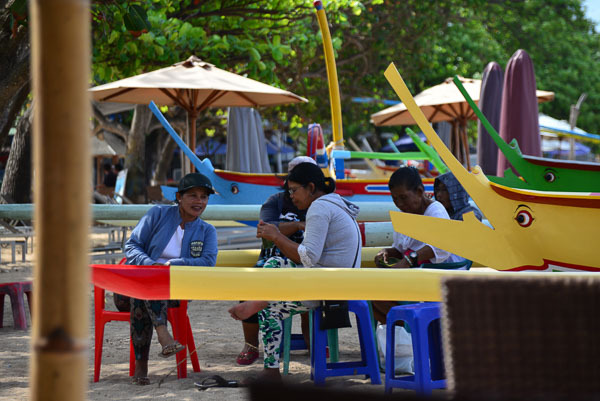 On arrival at the beach we are herded to the tourist shops and cafe’s and constantly assailed by hawkers, even when we are eating. Such a different vibe to Bali. The beach is pretty though and those little outrigger fishing boats abound. Talking to a couple later, who were sensible enough to ignore the cruise directors instructions, we learn that they had just hired a car and driver for half the price and had spent a pleasant day touring around the Island. We live and learn … well sometimes anyway. 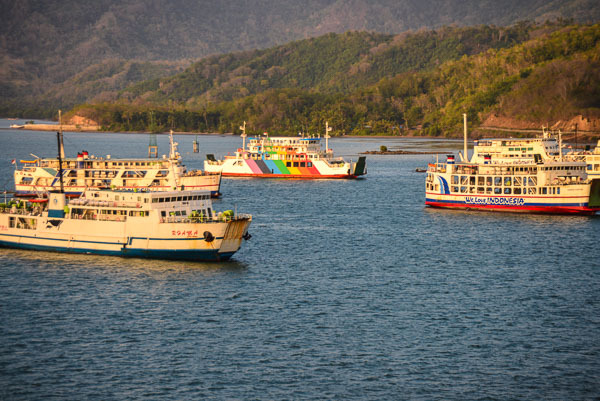 The other boats of Lombok. You may have noticed that I have not said much about the ship. 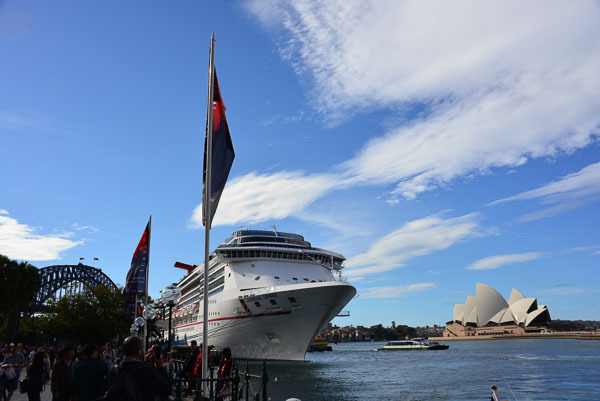 This cruise started from an Australian port, and was marketed as a “fun ship” and so it is full of Australians. You are surprised I know to find this out. We quickly coin two new acronyms, VLP’s and ELP’s. VLP = very large person. ELP = extremely large person. Both varieties abound on the ship and obviously enjoy the endless food on offer. 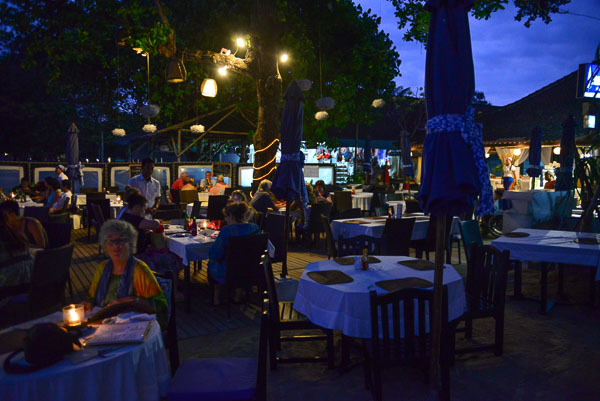 We enjoy the food too, especially the evening meal, usually by a circular window in the restaurant with the ocean slipping past. Three course meals and a glass of wine for Jacqui … just the thing. Otherwise we keep ourselves to ourselves pretty much and find that we have a very quiet time (this is a good thing as far as we are concerned) amid all the noise and revelry. Difficult not to compare with the last cruise in the Mediterranean with the somewhat upmarket Holland-America but all in all things went well. The atrium with it’s glass lifts and the always occupied cocktail bar. 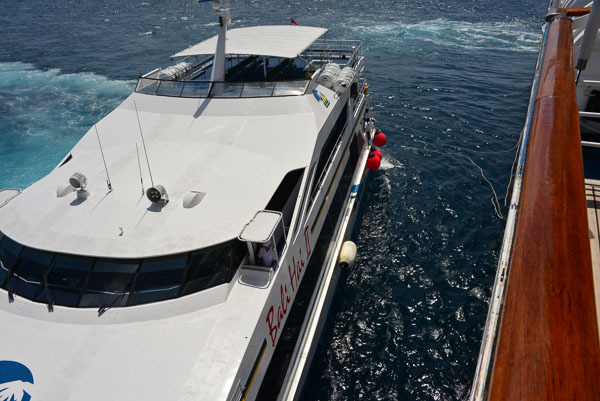 We have decided to give Bali a miss since we will be there in a couple of days anyway, and are rather glad we do, since the swell was up and tenders and ferries are having a hard time getting passengers on board. 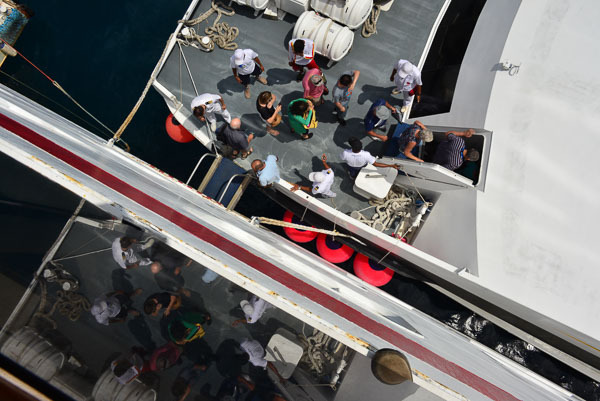 A large local ferry is used to get passengers ashore since the swell makes it very difficult for the ships tenders. Passengers scramble aboard the ferry. We feel as if we have had a proper sea voyage as we tie up in Singapore. We now have a taxi ride to the airport to catch our flight to Denpasar and our two weeks of luxury. 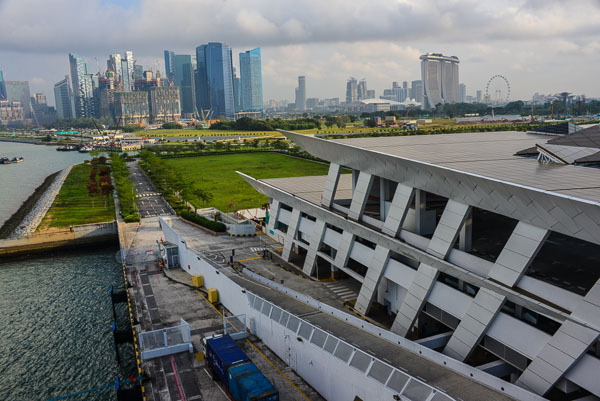 The very fancy Singapore cruise terminal. Waiting for the new passengers to board. Bye bye ship! It’s our first time in the new Airport in Denpasar and it is somewhat chaotic, especially for the taxi’s. A board with our names on is waving above the crowd as we leave the terminal and soon we are off into the maelstrom that is the road system in Bali. When we were being sold the “holiday package” we were shown a beautiful, one bedroomed apartment a short walk from the beach and so our expectations are quite high as we approach the hotel where we will stay for the next two weeks. 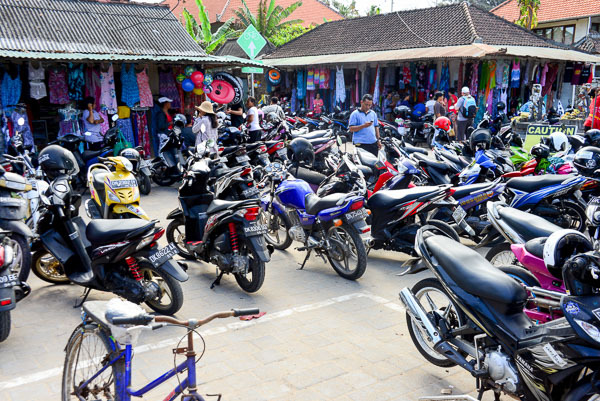 Through the centre of Seminyak, down a dusty back street and …. a very average two star hotel and then into a small room on the ground floor which has not even enough floorspace for a chair. Mmmm. Not quite what we had in mind. We quickly get the room changed to one upstairs so that at least we have a view and a breeze. I send a snotty email to the company in response to which their representative in Bali turns up on our doorstep. He is sympathetic and explains that we were oversold the package and the person who sold it to us has since been sacked. Some consolation! The hotel is in the worst part of Seminyak (unless you are young or like to get drunk a lot) and the beach is a good two kilometres away. Oh dear. The rep suggest that he can find us another hotel and so after a couple of days we are moved to a very fancy hotel (in comparison anyway) which is really in the middle of nowhere. The room (a two bed apartment with one bedroom door locked) is nice enough and the swimming pool is great. The only place to eat is at the hotel and so it’s all rather like a gilded cage. Onto the internet we go … we have to get out of here in-spite of having a week still to go. We go instead to Candidasa to be next to the ocean and to get a bit of quiet. 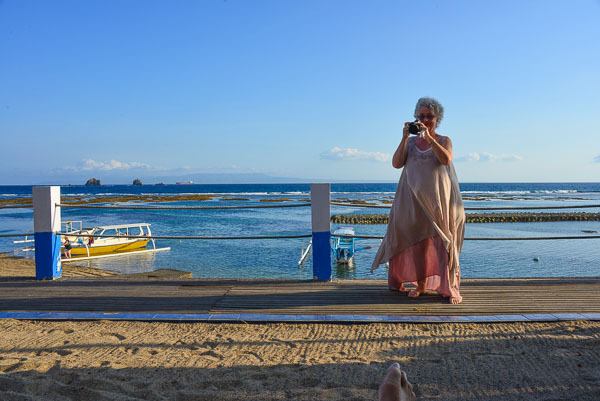 The Bali Shangrila Beach Club is our choice and it turns out to be a good one. Just what we need. Small and right on the beach. … and the view is worth having. Across the bay to Lembongan Island. 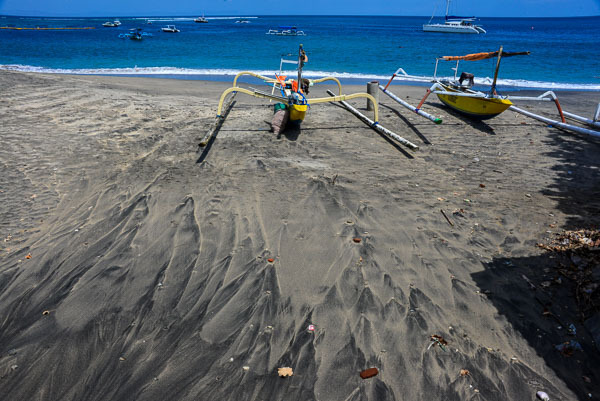 Candidasa was originally the archetypal Bali beach. Fishing huts amid the coconut palms alongside a long sandy beach with a beautiful coral reef just offshore. Just what the travellers in the ’70s and ’80s were after. “Let’s develop it” said the locals, “what do we use for building materials? I wonder…” they said. “I know” said some bright spark, “lets blow up the reef and use that!”. Which they did … and guess what … all the sand disappeared within a short space of time! In the meantime, they have built concrete groins to try and persuade the sand to return, largely unsuccessfully. One small beach is it … the rest of the beach is covered in large stones. Hey ho … I guess that didn’t work. That said, we enjoy Candidasa for not being crowded and for several cheap but excellent restaurants to indulge in our favourite pastime of eating. For Jacqui there was SHOPPING! The lagoon in Candidasa. Still alive with fish and water lilies. As for you women out there … I’d avoid Bali! So we then have another rush of blood to the head, and decide four nights in Ubud would be just the thing. Back to the internet and a booking for a home-stay … in the back of our mind the home-stays of the 80’s and 90’s we stayed in so often. (A remark about rose coloured glasses is probably appropriate here). The taxi drops us off some distance from our supposed destination (“Too busy” he says) and having parked Jacqui in a cafe with the cases I go off in search of our home-stay. Having found it at last we wheel our cases down the busy (don’t remember cases last time … young and fit and packs I think), through the ‘home’ to the ‘stay’ and a dark room with an even darker bathroom of sorts. A mossie net full of holes and no screens on the windows. Oh dear … not quite like we remember. 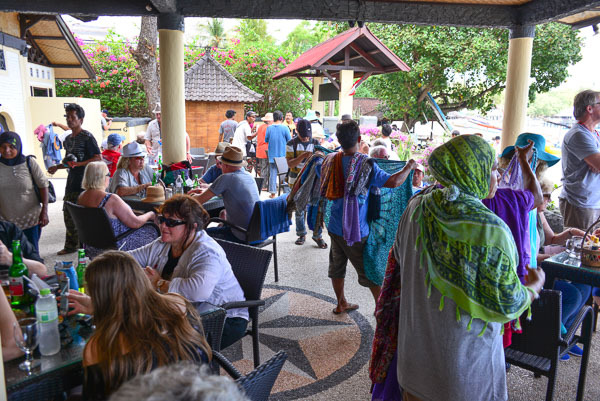 Ubud was packed and very unappealing … oh how times change. 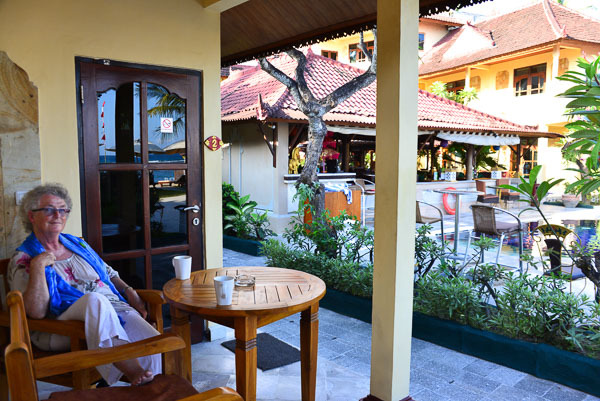 It’s breakfast in the garden (the reason why we chose this place) and we are back on the internet booking another change … this time to Sanur. In spite of having paid for four (cheap) nights here we really can’t see us lasting it out. Sanur is such a relief. That bit where there is just a footpath between the beach and the hotel. 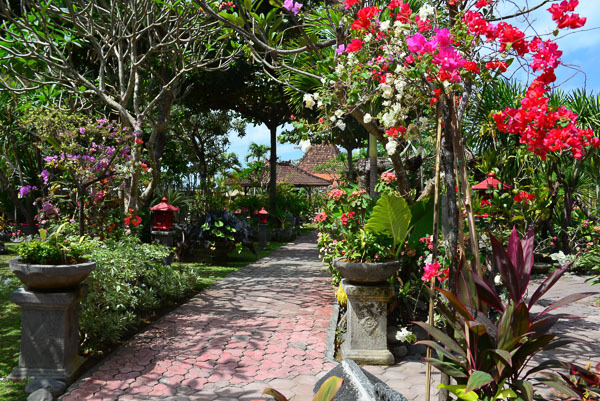 Away from the incessant motorbikes and into a proper Balinese garden. Wonderful. Now we feel settled for our last few days of this adventure. 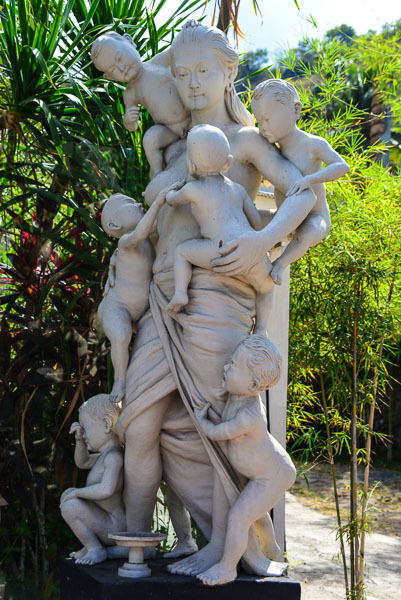 A proper Balinese garden at last! It’s been an interesting trip. We have done new things and tried to repeat old things that didn’t work. Through it all has run curiosity and a feeling of freedom … freedom to do the unexpected, freedom to change one’s mind, freedom to enjoy whatever comes along in whatever shape it takes. And each other! May you all have everything you wish for in 2016.
ps … a few extra pics to finish off. Locals while away the time between customers. If you can’t ride them … park them. 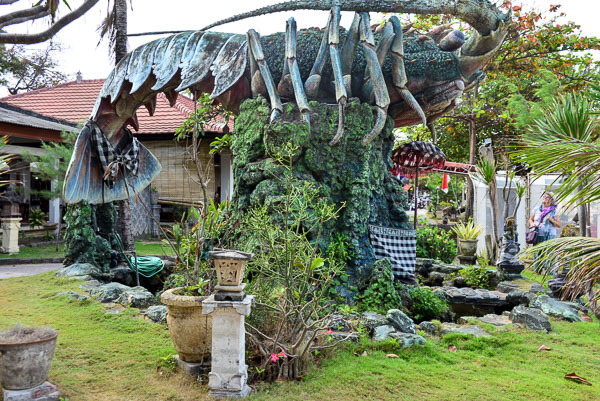 Australia is not the only place to have a giant crayfish. Our last meal on the beach of Sanur with the moon rising over the ocean. Ah! Om Mani Padme Hum. 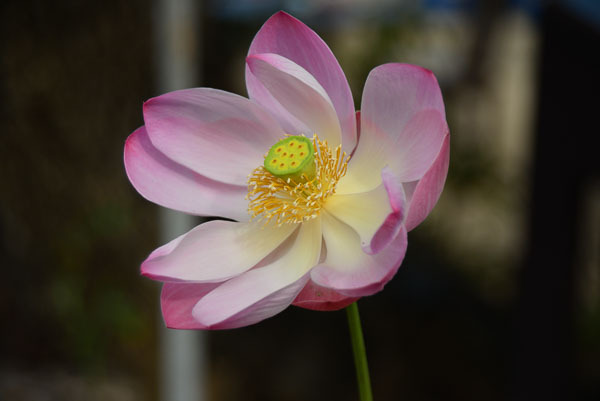 The jewel in the centre of the lotus. V.nice crayfish and jewel there thanks Allan. Happy cruising to you both in 2016. As usual, Alan, such a vibrant “compte-rendu” and beautiful pictures, thank you so much. I saw you both in Tewantin the other year, both on bicycles, looking like you had a great time. No need to go very far… All my wishes for a lovely New Year to you and all the people you love. My New Year’s resolution to take at least half an hour each day to read… and reading your message and looking at the photos has inspired more goals for 2016..
Great to live vicariously through your lovely travels. I am also going to Bali in a month and later this year will attempt my first cruise. Maybe! So its great to read about yours. Wonderful to be able to stay in touch this way. Much love to you both! Happy new year to you Andrew! Glad you enjoyed the blog. 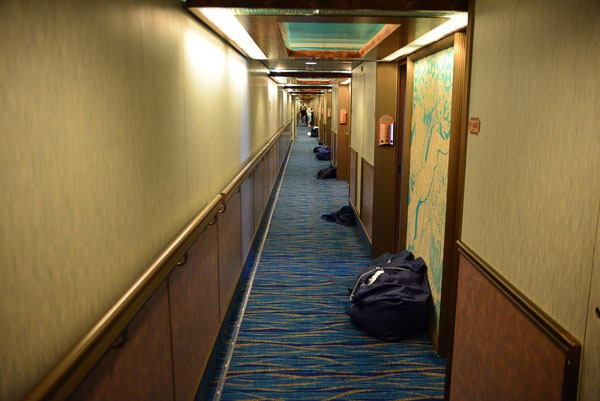 We are a bit hooked on the cruises it seems. We will be doing another one in the middle of the year.